Encana Corporation Vs. Whiting Petroleum Corp.: Which Is the Better Buy Now? An analyst recently said that Encana Corporation is a better buy than Whiting Petroleum, so this Fool put it to the test. This week an analyst from Deutsche Bank upgraded shares of Encana Corporation (NYSE:ECA) from "non-rated" to "buy." At the same time, Whiting Petroleum (NYSE:WLL) was downgraded from "buy" to "hold." Both stocks were also given new price targets, with Encana awarded a $12 price target while Whiting Petroleum's price target was dropped from $29 to $23. Both price targets are higher than the current stock prices, but Encana's target has more upside. 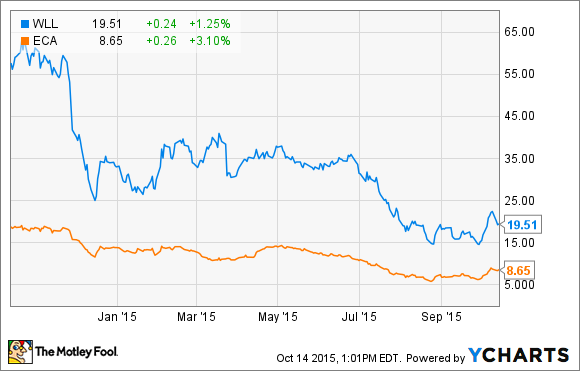 Encana's stock is down 54% over the past year, while Whiting's is down 66%. The main reason the analyst sees greater upside at Encana is the strategic moves it's made over the past year, enabling it to create more value at the current oil price. That's really the core difference between the two, as the bull case for Whiting Petroleum rests on a higher oil price. Encana has really made a lot of progress to reposition its business over the past couple of years. It has gone from an unfocused natural gas producer to a focused liquids growth company. It did so by jettisoning much of is disparate natural gas assets to focus the bulk of its attention on four core liquids-rich assets, which are now expected to drive 50% year-over-year growth in the company's liquids production. Source: Encana Corporation investor presentation. This move is expected to result in having liquids account for roughly 33% of the company's overall production. Further, this growth isn't growth at all costs, as the company is enjoying a pretty solid drilling return of 30% on new wells even in the current environment. Not only that but, the focus on drilling liquids-rich wells while jettisoning lower-margin gas assets is also improving the company's margins on a per-barrel-of-oil-equivalent, or BOE, basis from around $23 per BOE to start the year to $26 per BOE by the end of the year. At the same time, Encana has vastly improved its balance sheet by jettisoning lower-margin natural gas and other non-core assets. This year alone, the company expects to reduce its net debt by $3 billion as a result of asset sales. Thanks to this cash infusion, the company's balance sheet is really strong, as Encana has an investment-grade credit rating and a tremendous amount of liquidity, including $4.5 billion on its revolving bank credit facility. To sum up the bull case, Encana's repositioning has the company well positioned to not just survive the downturn, but also to thrive as it can profitably grow even at the current oil price. Copyright Encana Corporation. All rights reserved. Whiting Petroleum, on the other hand, is already a very liquids-focused company, with oil making up 80% of its production. As such, its growth doesn't have the same impact on its margin per BOE as it does for Encana. In addition, its balance sheet isn't quite as strong as Encana's, though it's no longer the weak link it was to start the year, since the company raised a lot of cash from an equity raise and asset sales to bolster its balance sheet. But there's a key difference between the two: Encana is in a better position to grow its production during the current environment than Whiting. Given how everything stands right now, Whiting expects to maintain flat production next year at the current oil price. It estimates that it will generate roughly $1 billion in cash flow, which is what it needs to invest in new wells to keep its production roughly flat. Encana, meanwhile, doesn't even have to grow production to create value. That's because it will create value simply by improving its per BOE margin as it replaces natural gas production with oil and NGLs. But if oil prices rise, Whiting will be in a strong position to create value. First of all, its cash flow will rise much faster, given that 80% of its production is oil while only 22% of Encana's production is. Further, its returns will improve greatly when oil prices rise. Currently, it's earning a 31% internal rate of return on new Bakken shale wells; however, those returns balloon to 82% when oil tops $70 a barrel. While Encana's returns will also accelerate when oil prices rise, returns won't grow to the same degree because its wells are still somewhat gassier because of the areas it operates in. That gives Whiting more upside, but with the caveat that it requires higher oil prices. Any debate between Encana and Whiting really comes down to the outlook one has for oil prices. If oil remains flat to down, then Encana is the better buy now, as its strong balance sheet provides security, while its transition from gas to liquids is a big catalyst. However, if oil does head meaningfully higher, there is compelling upside in Whiting, as it benefits from the fact that 80% of its production is already oil, plus the wells it drills are oilier than Encana's and will therefore yield higher returns.